Yet again I don’t want every album to sound like this. There are lots of songs and albums where this sound would not fit – but like in a really good book… The tone of the words fit the story perfect. Daniel Lanois produced Dylans 1989 album “Oh mercy” as well – and it is an amazing album too… But in my world Time out of mind has that extra something that makes it even more of an album instead of individual songs.. The stories and lyrics focus on mortality, love and art in a way anyone can relate to and at the same time have different levels like a fairytale filled with muses who deliver divine inspiration and muses who don’t. This post is written in one piece a Saturday evening with my headphones on and in the company of Time out of mind. It was an exciting new way to listen while writing – It confirmed me in my love for the album and my experience of it being a very important timeless piece of art – I will re-read again – for sure. Jan Holmquist is head of library development at Guldborgsund-Libraries – a public library in the sourth eastern part of Denmark, Europe. Guldborgsund-Libraries are a proud partner of Read Watch Play. Jan is part of the German library development network – Zukunftentwicklers and is also a Dad, Crowd funder, Music listener and drinker of good coffee. Jan is a member of the international library crowdfunding teams Buy India a Library and Help This Week in Libraries and is working with an international learning project in the spirit of 23 things about apps on iPad mini. I wrote this about my favorite album for Read Watch Plays topic about re-reading. Can you read an album? Interesting. 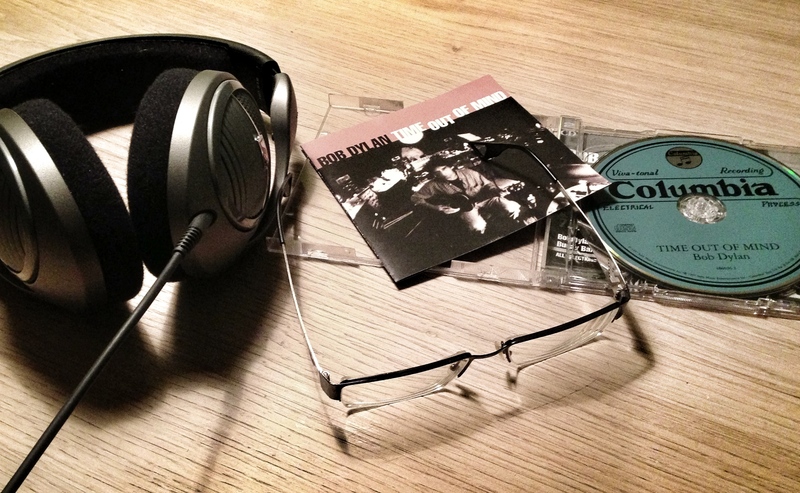 I’m going to read-and-listen Bob Dylan this night. This is my favourite album of all time as well. I agree that the sound of this album fits the songs perfectly. It’s hard to imagine it sounding any other way for me. Sure, Bob had produced World Gone Wrong a few years earlier and maybe was looking forward to being more independent in the studio (as he generally has been with all records post-Time Out Of Mind), but I don’t think he would have been quite up to the task for this mammoth record. I think his biggest triumphs in production are “Love and Theft” and Christmas In The Heart, two beautifully produced albums with crisp sound and well-led groups. Time Out Of Mind is a different beast in that regard as well; many musicians contributed to the set and their unique voices are sort of blended together in the mix. It’s often hard to tell how many guitars are playing, etc. and it serves to make Bob the star– Lanois makes him sound so alone even though there are tons of other musicians around (or maybe this is possible BECAUSE there are so many others around). What an album. It was the first album of new material he released in my memory (I was only a year old when under the red sky came out) and so it has a special place in my heart. I can’t see this one ever being replaced for me. No album knows you like this one does. I feel like somehow it still hasn’t earned its due. I agree about his own “Jack Frost” Production. “Love and theft” is SO good – and the Christmas album production is both pastiche and perfect at the same time. I also really like the production of most songs on “Tempest”. You really nail it with the Lanois make him sound so alone comment – That is so true in the best possible way. Great short critical analysis of one of the late great Dylan albums looked at as a piece of art. Thank you for reading and for your very kind comment. Highly appreciated. Time out of mind is the masterpiece of depressive art. Success is survival, Leonard Cohen may have said that. Roll on Bob!